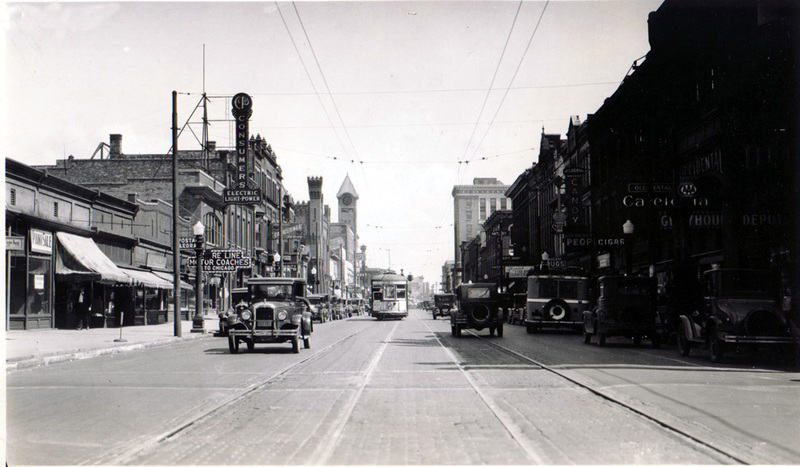 This is Western Avenue looking east from the third street intersection. 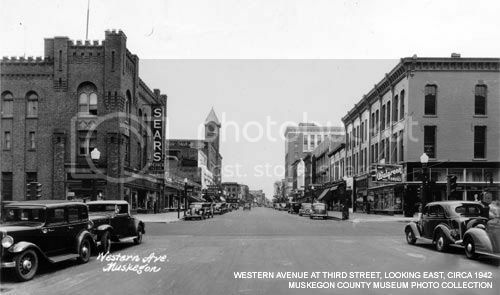 Almost all of these buildings were destroyed to make way for the Muskegon mall. 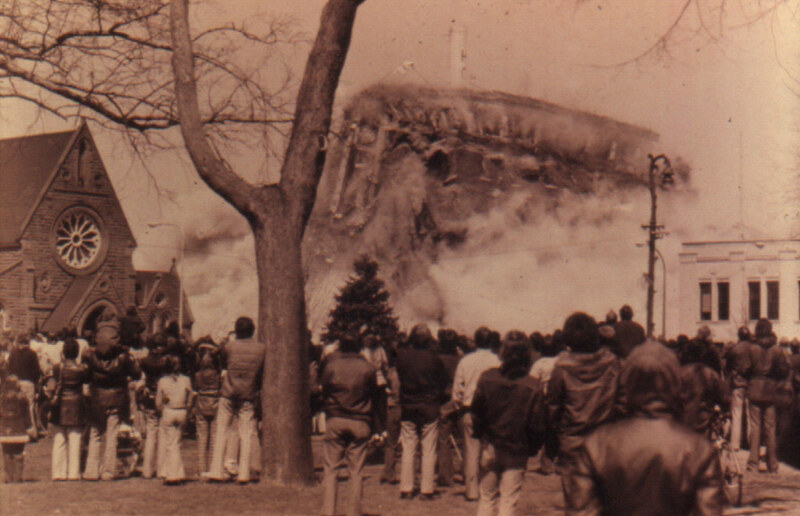 The tallest building on the right in the background still stands. 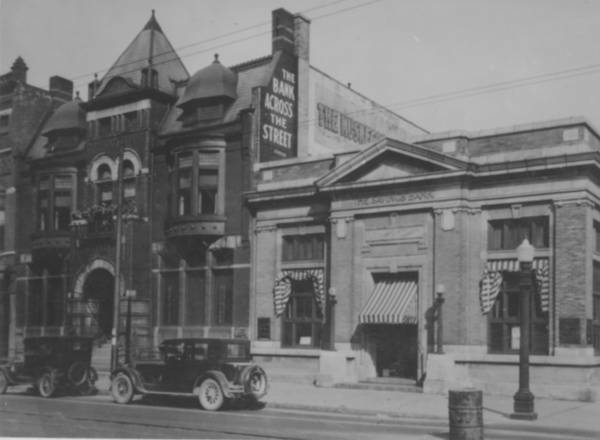 It was once the Hackley Bank Building, most recently it housed Comerica Bank before the mall closed. 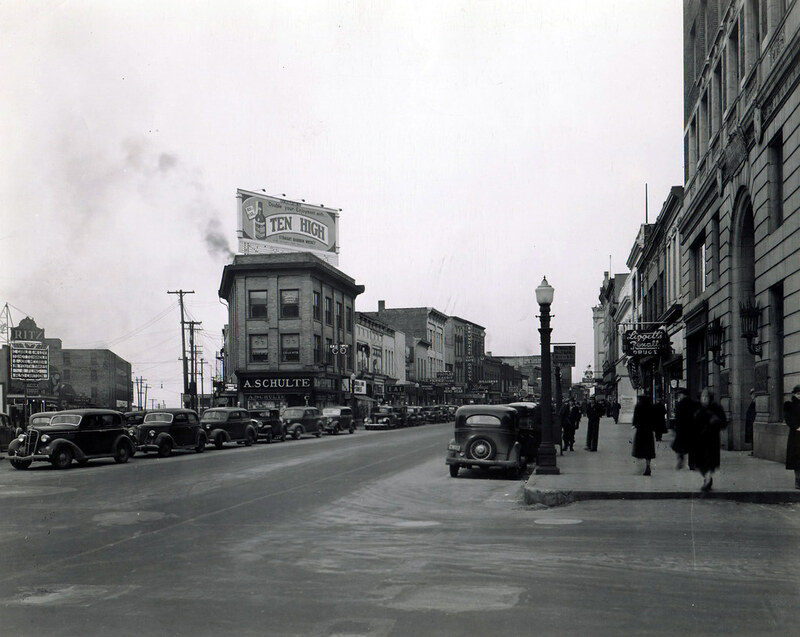 The building long ago had its facade changed to a duller white. 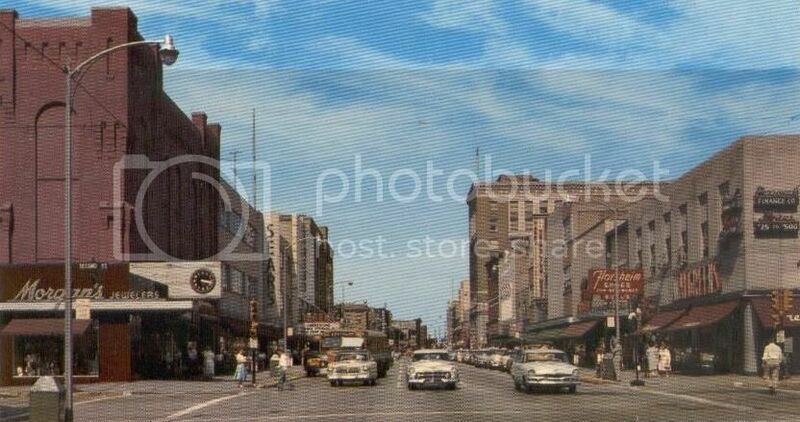 Also on the left hand side of the picture you can make out another building still standing, the former Daniel's Office Supply building. It is the four story building two doors down from the Consumers Power building. Nice pic; I always enjoy seeing historic photos. Nice, I don't think I've ever seen that top one before! I've got more pictures I'll post later. 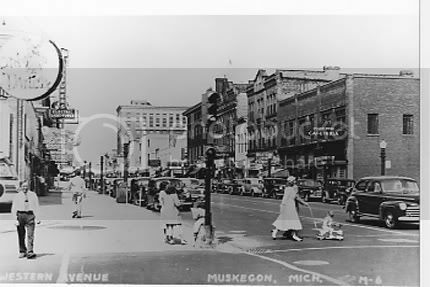 So WHO made the decision to destroy downtown Muskegon and when did it occur? Who was the mayor and council at the time? I'm sure they thought downtown malls were the wave of the future, but to destroy all that!?! It must have deteriorated to a state of hideousness for them to have made such a decision. How did that happen? 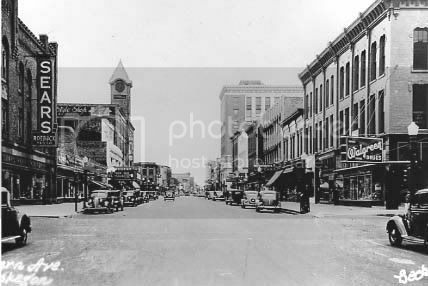 This could very well look as vibrant as downtown Holland does now if anyone had cared enough to invest in some of those buildings. Now they're paying a fortune just to replace what they once had. It's quite sad. Makes me wish I had a time machine to go back a be a consultant! Are there stringent design guidelines as to what can be built on the new mall street? Exterior material types, cornice work, amount of ground floor transparency, etc.? I assume there is, but I was wondering if you could share the details. Finally getting around to this. A link to the development guidelines is available below. Yes there are. The DMDC is developing the site as site condominiums, which allows them to set pretty stringent design standards. I don't have the full guidlines, but the basics include: zero lot line construction; a minimum of two stories; a build to the right of way requirement; materials compatible with the exisiting buildings; green engineering standards; and street level commercial space along Western Avenue. I hope this helps. Dan Rinsema-Sybenga probably has the actual standards somewhere in his office. Alright, I need to breath some life back into this forum. 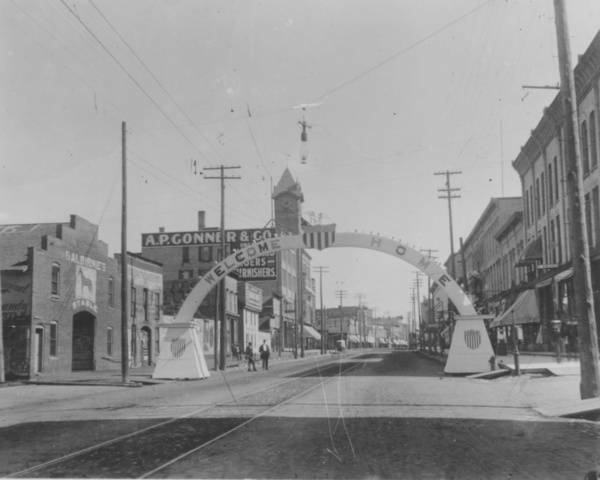 Here are a couple more historic pictures. 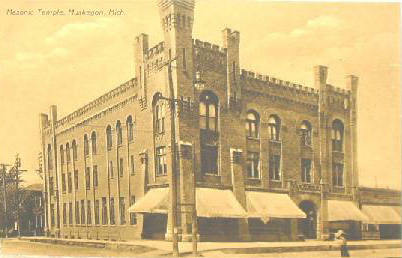 This was the old Masonic Temple. 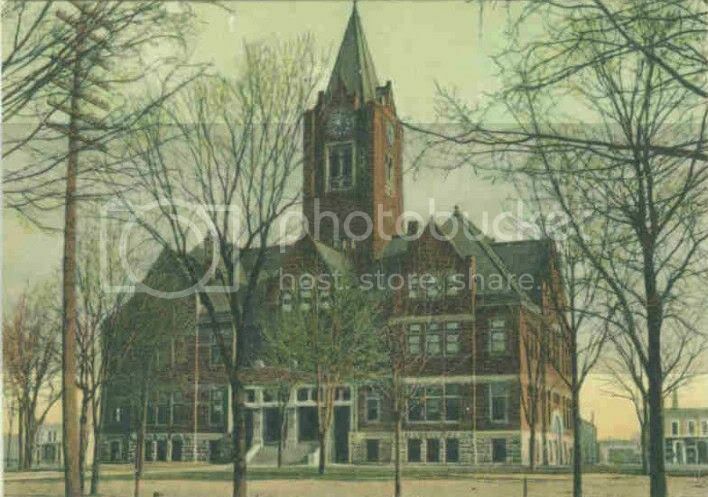 I know at one time the Muskegon Chronicle had their offices there and at another time Sears was a tennant there. 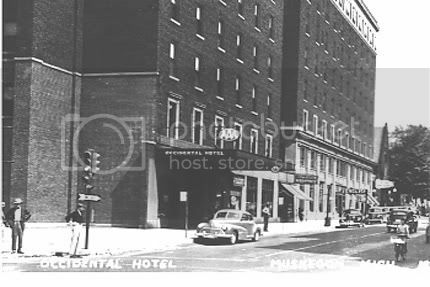 ...and here is another picture of the Century Club and bank that were among the five buildings to survive the demolition of the mall. 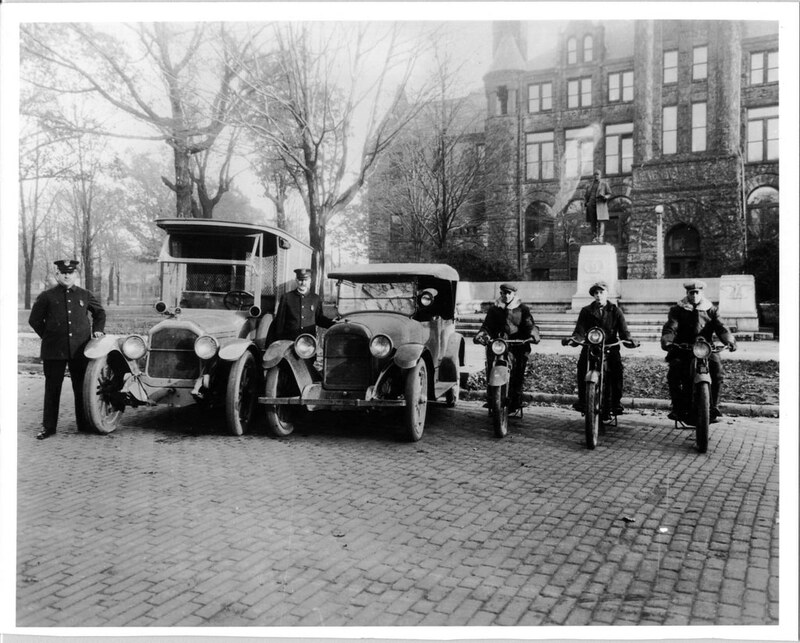 Finally, this is a picture of the Muskegon Police Force in 1920, or at least part of it. 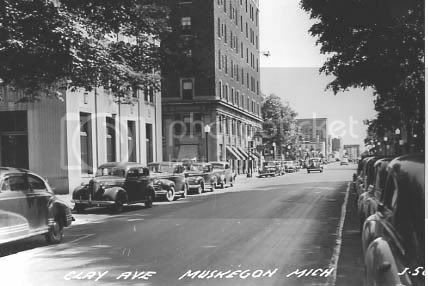 They are posing in front of Hackley High School, which is now the administration building for Muskegon Public Schools. Well Larry, as with all projects it has positives and negatives. 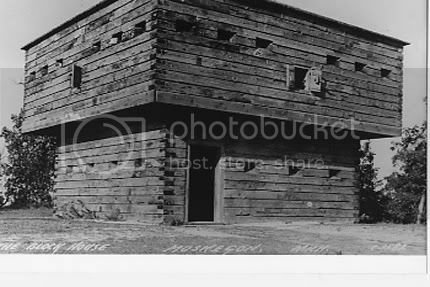 In my opinion the building will be attractive, especially having brick on all sides, but as I mentioned in the fire station thread I wish the design had been stacked similar to the old station. I understand your argument that it would have cost a lot more that way and I know money is scarce right now, but I am of the opinion that nothing good comes cheap and since this building will be around for decades to come it should be built right so people in the future don't view it as another mistake. Also I don't care for the location. It will be right on Western, the street we hope will one day be a great shopping district. I hope one day the development reaches all the way down Western and curves into Pine Street, another former retail area, but with this at such a prominant corner it will be a barrier to business east of the station. 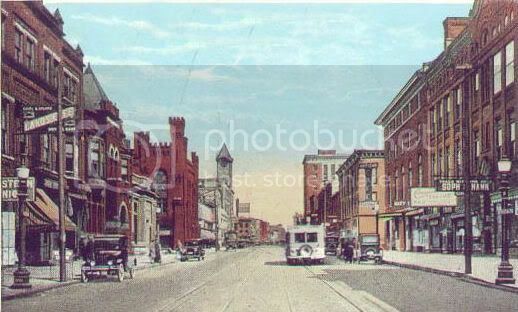 I think the station would have been better on a street such as Morris or Clay instead of the retail main street. I know that the station is being built where it is because the City already owned that land and it was part of the deal with Hot Rod, but even if the station could have been moved slightly north on Terrace and the Hot Rod guys put their commercial building on the corner of Western and Terrace it would be much better. The station just seems like a suburban design than a downtown one, and this has been a trend going on for too long. I know that my opinion sounds largely negative. I just think Muskegon deserves the best. 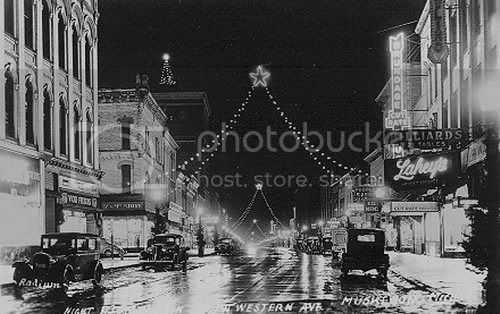 First 5 pictures are from around 1940. I undestand your concerns. I will point out that the north side of Western Ave between the new fire station and Spring St will be developed as part of the Hot Rod Harley-Davidson project. Construction should begin when the weather breaks. The Harley guys saw some of the same things you do and they moved the food court commercial building to Western Ave.
Pine Street is already picking up with the new micro-brewery. There should be some announcements coming soon. As far as the design of the station, what makes it suburban? It is multi-story and built on the street instead of being set back. The employee parking will be behind the building. Other than the offices and living space not being on top of the engine bays, I'm not sure how more urban the building could be. Speaking of cost, we did spend quite a bit more to brick all four elevations of the building instead of using split-face block on the back side of the building. We recognize that the back of the building is what will be seen from Shoreline Drive, and we wanted it to reflect well on the city. You're right, after I posted I felt I was too strong in calling it suburban. I think it's the angled roof that made me feel that way, when I think of downtown buildings I think of flat roofs. Angled roofs remind me of houses. Also I did not know the employee parking was going to be behind the building. None of the articles I read mentioned the parking so the fact that it'll be in the rear pleases me. I think it wouldve been cool to live back then and see those places like that. Okay, this thread has been silent for too long. 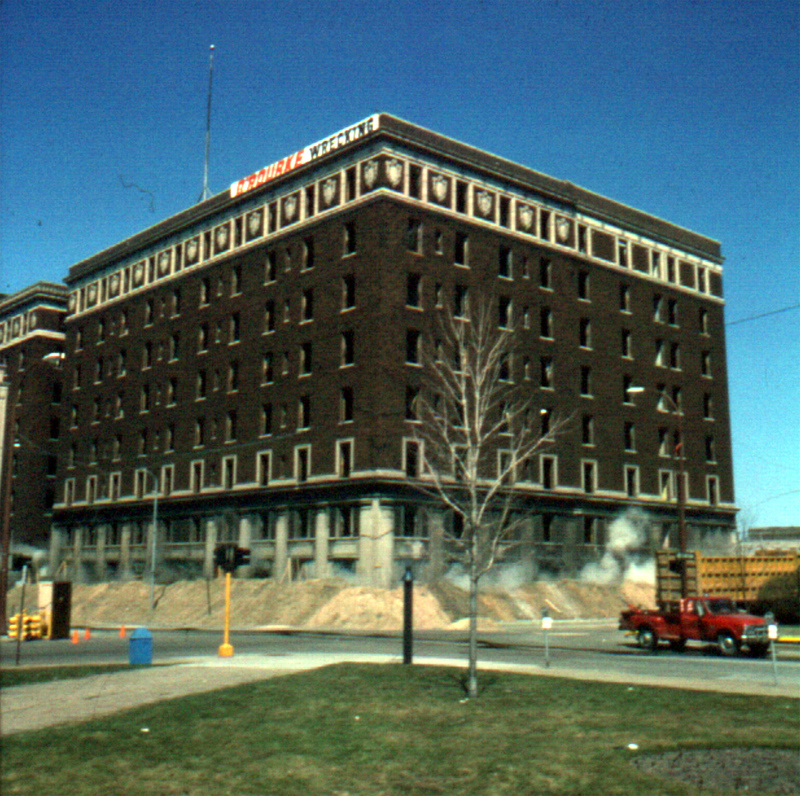 Well if anyone still reads this here are two pictures of the Occidental Hotel being imploded in the mid 1970s. For some reason this second picture was flipped. The church should be on the right side of the picture, and the Chronicle building on the left. 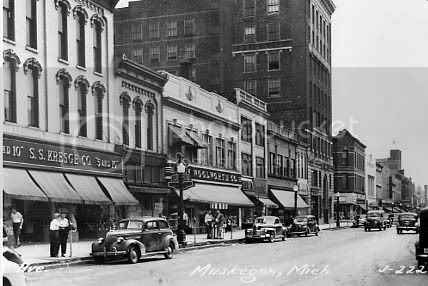 This building was at the corner of Clay and Third and was demolished to make way for a parking lot for the Muskegon Mall which was under construction at the time. This site is where the new Baker College Culinary Arts Center is planned. 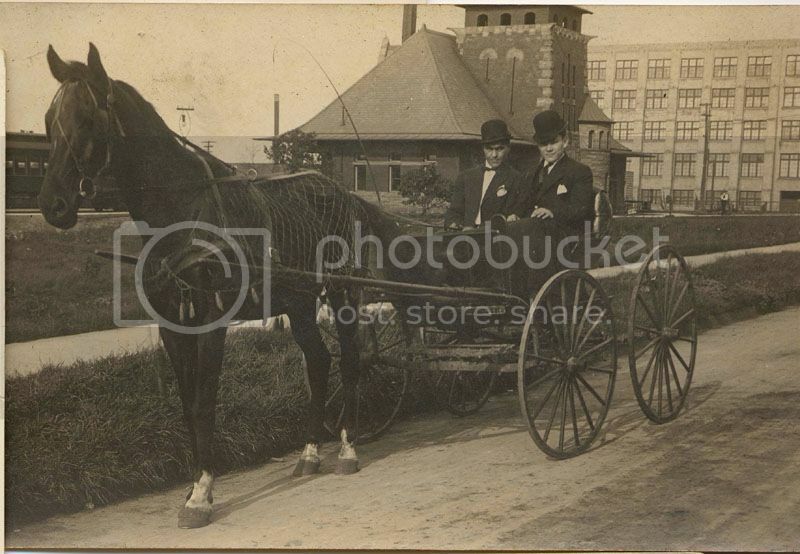 Here is a picture of the Muskegon Brewing Company in 1884. 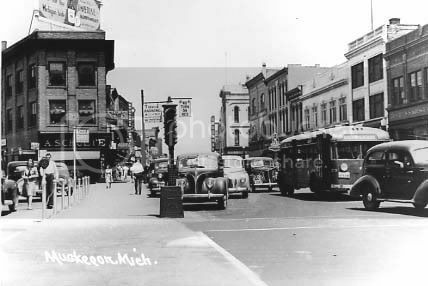 As you can see by the watermark it's a Muskegon County Historical photo, hopefully no one from the county comes after me for posting this! From the aerials I've seen this building was approximately where Coles Bakery stands today. Also note the road appears to be made out of wood and to the left there are street car tracks. 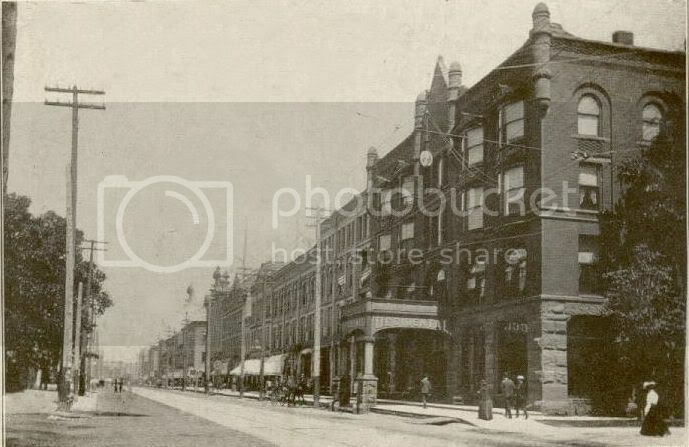 The Flatiron building that was located at the intersection of Western Avenue and Market Street. 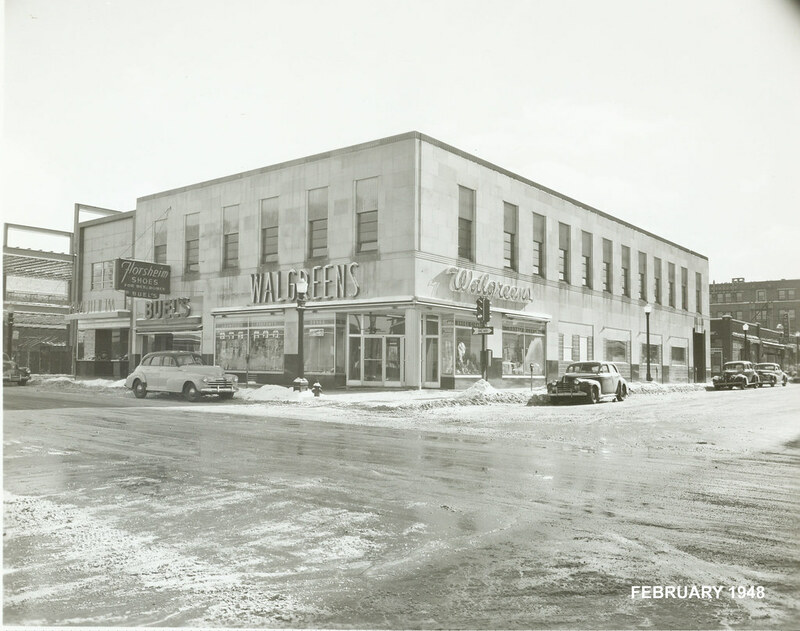 The building was there until the mid 1970s when it was demolished to make way for the mall.